When we arrived at Bottomless Lakes State Park, the thermometer in the truck read 90 degrees. Bottomless Lakes is named for the series of sink holes or cenotes which punctuate the park. The campground is set next to the largest of the cenotes, Lea Lake. This is the high desert. The landscape was all sandy dirt, rocks and scrub bushes. The far side of the lake rose abruptly into jagged red cliffs. The park is well known in the area as a great place to cool off. This I can believe since it was broiling hot in the middle of March. I cannot fathom what July and August must be like. Just because the humidity is low, hot is still hot. The park has public access for day visitors and when we arrived the parking lot was packed and the lake resounded with the cries and shouts of many swimmers. We pulled into our site. It was hotter than blazes and the sun was burning everything it touched. We unhitched and set up camp with the perspiration dripping down our sides. Our site was next to the lake as advertised, but that was actually less than ideal as it meant we were next to hordes of children jumping in the lake. The campground was barren of trees and color. A few scraggly bushes decorated our site. The picnic table was sheltered under a cement structure. Hundreds of ants swarmed the table and shelter and I quickly hustled Dakota away. Desperate to cool off, we decided to avail ourselves of the lake. We suited up and headed over. The water was surprisingly cold and we waded in. The water was brown, but the cold was a relief. I dunked under to take full advantage. The water was brackish and suddenly less appealing. Even though we were now much cooler, we decided a shower was a necessity. We grabbed our shower items and headed to the camp bathhouse. Over at the lake we had noticed signs saying some of the public bathrooms were closed for the winter. It was immediately apparent that the overflow day campers were using the campground facilities. Despite signage designating the campground from the day areas, people were swarming through the campground. When we got to the bath house, the campground host was in the middle of hustling some people out who had actually tried to lock themselves into the women’s room for privacy. The bathrooms were absolutely filthy and littered with detritus. I will spare any further details except the shower had a push button and water would flow in a weak stream for thirty seconds and then shut off. Back at the trailer, we gave up and fired up the air conditioning. We huddled in misery in the trailer. Perhaps it was just an unfortunate confluence of many factors and timing, but this was an untenable situation. We had booked five days at this place. We came the closest to snarling at each other as we have during the entire trip. Something had to give. When we decided to get only one air conditioner unit for the Airstream, there were multiple factors driving the decision. One factor was that meant we could use 30 amp, rather than 50 amp service and that would give us more flexibility when looking for campsites. Another factor was our disinclination to use air conditioning. If we got to a place which was too hot, we figured we could always hitch up and head out for cooler climes. This philosophy would now come into play. The desert air was cool the next morning. The day visitors were gone and it was quiet and calm at the park. Nevertheless, we knew the day would soon warm and the weatherman on the news the night before had predicted a record heat wave. I remembered wistfully the drive over and how cool it was around Ruidoso. The elevation was just over 6,000 feet and the mountains were covered in cedar and pine. I called an rv resort just outside the town and we hitched up and headed out. The benefit to having your house on wheels is you can always just take it with you to a better place. This we did. It was tough leaving Franklin Mountains. It is always bittersweet leaving a place which we have enjoyed. We headed north towards Las Cruces on Interstate 10 and then banked northeast onto Highway 70. Highway 70 gave us a good ride. We passed the area around Fort Bliss and the White Sands Missile Range. We were puzzled to see hundreds of people out walking the desert. It was quite hot and we were both curious what they were up to and happy we weren’t out hiking in the hot sun. We found out later on the news that it was 75th Anniversary of the Bataan Death March. They were out marching for charity over 26 miles of hot sand. They even had a survivor of the march on hand although he didn’t march. We next skirted the blazing white sands of the White Sands National Monument. This is the world’s largest gypsum sand dune. I think it was enough for me to see the glistening sands from the cool window of our truck cab. Our road continued to a range of low mountains which marked Almagordo. The brown hills rose high above the sandy Tularosa Basin marked with scrub and mesquite. The road turned northward and we passed shops and stands selling pistachios. One shop featured the world’s largest pistachio nut sculpture. It would have been nice to stop, but for some reason these guys don’t think about 48’ trucks and trailers when they plan their parking lots. I don’t know why because the roads are full of rv’s. You just don’t want to get caught in a parking lot with no space to turn around or pull through. The next major attraction on our drive was a charming looking town called Tularosa, the City of Roses. The main street featured some historic old buildings many of which now sported shops and cafes. If I worked or lived near Almagordo, this might be where I would choose to live. It had a good feeling to it. We were now thinking seriously about lunch and looking for a place to pull into. Just outside town, a Subway sandwich shop sat next to a large empty parking lot. We pulled over and went in to order. We were finishing up our sandwiches when a big Fifth Wheel pulled in right next to us. We all commented on how thoughtful the Subway was to leave us a nice big parking space. Past Tularosa the road began to climb. The country became hilly and soon trees appeared. The thermostat on the truck descended to a more comfortable range. We entered the Mescalero Apache reservation. My first reservation! It was a relief to see green hills after so much tan and brown. Modest homes lined the roads along with the reservation headquarters. We had been seeing billboards advertising the Inn of the Mountain Gods Casino since before we hit El Paso and now we found out that it belonged to this reservation and tribe. Next Highway 70 lead us through Ruidoso and Ruiddoso Downs. These twin towns were full of hotels, rv resorts and more casinos. Ruidoso Downs featured a race track and the Billy the Kid Casino. During the summer season quarter horse and thoroughbred races attracted gamblers and tourists. There were also signs advertising Ski Apache, also owned by the Mescalero Apaches, and the town did have a look which was half western desert town and half ski resort—an interesting, but pleasing combination. Highway 70 now turned eastward turned eastward following the Rio Hondo which wound through a lovely valley. We passed the towns of Hondo and Tinnie. Ranches spread across the valley with horses and cattle. The air was fresh with the scent of the pines on the hillsides. It was a very enjoyable drive. The road descended out of the valley to high desert plains and the temperature climbed. We pulled off the road at a rest stop. Signage announced that we were in the Atlas Missile Range. It directed us to look for silos and one sat just a short way from the road. The dry and dusty road continued across flat desert plains. Our drive continued through the town and county seat of Roswell. Billboards sporting aliens sprouted from the desert. In Roswell we motored past the UFO Museum. We were in alien territory, but for the life of me I couldn’t figure out why any alien would choose this barren, arid and hot place to visit. The second day’s big push across Texas took us from Crystal City to Eagle Pass and Del Rio on Highway 277. The scenery remained much the same with some brief interludes with less and then more vegetation. The area around Del Rio was dry and dusty, but the same could be said for much of the drive. Our route followed the line of the border for a great distance. Border patrol cars were much in evidence. They seemed to be very active in insuring there were no incursions. Just past Del Rio, we encountered a surprise (for us) border patrol station. All traffic in both directions was being funneled into this mandatory stop even though we weren’t crossing the border. We pulled in and were confronted by an imposing and humorless border patrol agent. Where were we going? Where were we from? We showed him id which he scrutinized carefully. I felt guilty even though I knew we had no illegal aliens or substances on board. Dakota didn’t need to show id which is a good thing since he doesn’t have any. We were let through and breathed a sigh of relief. Not quite why we felt so anxious, but that is how we felt. We motored on and our anxiety was slowly replaced by hunger. We began looking for a place to pull off and make a little lunch. Off to our left was the enormous Amistad Reservior. It continued for miles with signs directing traffic to different parts of the giant reservoir. It was an oasis totally at discord with the surrounding dry hills. Just before we hit Langtry a sign appeared to our left which said “scenic picnic area.” We pulled off the highway onto a road which led upwards and around. Entering uncharted roads is always a little hair-raising. Would there be a turnaround? 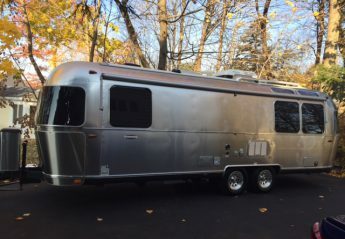 Would the road be passable for our Airstream? At last to our right a magnificent vista appeared—far below us an impressive bridge spanned a wide river which had cut a deep ravine through the surrounding cliffs. It was breathtaking all the more so because it was so unexpected. I felt a little dizzy taking it all in. We pulled to the curb in a large parking area with picnic tables and shelters. The wind was blowing and it seemed like we could topple on down the cliff. Back when we were in Navarre on the Florida Panhandle navigating the main road we had seen a remarkable vehicle ahead of us. It was an extremely tall and ungainly looking camper van. It was like nothing we had seen before. It perched on enormous tires which looked like they could have supported a tank. The strange looking camper sported french license plates and two motor bikes were strapped to the back. Clearly these intrepid souls had shipped their beloved camper to the States for a big tour. It was an odd and unforgettable sight. Hundreds and hundreds of miles later in this parking lot perched high above the Pecos River, here was what looked like the same strange contraption. French plates, motor bikes and giant tires. Could there be two of these vehicles or had we miraculously re-encountered each other? We sat in our Airstream contemplating the view and enjoying lunch. Finally, I could take it no more. I had to ask. I walked over to the strange vehicle. It was so high the steps to gain access were actually a ladder. The door was open. The occupants were likely enjoying their own lunch. The landscape was arid. The air was warm. The highway wound through hills and valleys dotted with dusty scrub, mesquite and rock formations. We passed signs directing us to Big Bend State Park. Another place we would love to see, but must save for another trip. We reached the Fort Stockton RV Resort in the late afternoon. The sun was beginning to set and, while it was still very warm, it would cool quickly once the sun was gone. The rv resort was large with a few brave trees dotting the camp sites. Half the park was devoted to transients and half the park was clearly comprised of full time residents. It had been a long drive, but one full of new sights and adventures. We were tired from so many miles, but we unhitched knowing the next day was not a travel day. We would explore Fort Stockton. The ever present wind was blowing and we opened all our windows to catch the breeze. After Fort Stockton we would have one last leg in our hop scotch across Texas.